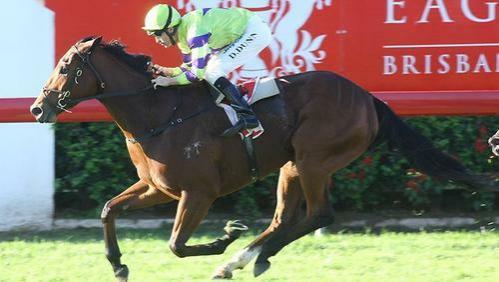 It was a fantastic weekend for the Noonan stable with Jake arriving home on Friday and then VARENNA MISS winning the Group 2 QTC Cup at Eagle Farm on Saturday. Tony is making the QTC Cup his own race with two of the past three winners, ORTENSIA having won it two years ago on the way to running third in the Stradbroke Handicap. VARENNA MISS put the writing on the way with a brave win at Doomben two weeks ago where she wobbled a bit around the corner of the tight track but still managed to get the money. Eagle Farm was always going to be more suitable to her as she is a big mare and requires lots of room, drawing barrier 18 is never an advantage, but Dwayne Dunn steered her brilliantly to sit midfield with some cover and she launched a devastating run in the straight to record victory by a length, leaving some well-regarded horses in her wake. A group 2 winner is always exciting but given the events of the past month it was a moment to savour for the whole Noonan Racing team. Thankyou to Brooke Schreuder who travelled up to Queensland with the horse, she has done a terrific job and has been well rewarded with the success of the mare. Congratulations to her owners, G M & Mrs K A Fraser, Miss E L Fraser & B J Fraser on a fantastic victory which I am sure they really enjoyed. We are now in the enviable position of having to decide whether she goes to the Group 1 Stradbroke Handicap next week or we hold her over to the Group 1 Winter Stakes a couple of weeks after that. Wherever she goes she should be very competitive after what she showed us on Saturday. A video of the race can be seen here.